The Chinese Parents Support Service Trust is asking the Chinese community to Think Differently about disability. “The Unlimited Love” is the title of the campaign to change attitudes and behaviour that limit opportunities for disabled Chinese people in Auckland. The campaign is funded through the Ministry of Social Development, Social Campaigns Team Family and Community Services. The campaign will utilise Chinese media, such as Chinese Voice Radio AM936, Skykiwi (most popular Chinese website in New Zealand) and Chinese Herald (newspaper) to introduce a series of local and national disability services. These include, Autism NZ Inc, Blind Foundation, Deaf Radio, Circability, Elevate Christian Disability Trust, Mental Health Foundation’s Kai Xin Xing Dong project, Independent Living Services and many more. Beside that, Philip Patston and Dr. Huhana Hickey also shared their inspiration about their work in the disability sector. Eva the CEO of CPSST hopes by introducing disability services Chinese people can gain an understanding of the services available for them. According to The New Zealand Disability Strategy One in five people, in New Zealand report having a long-term impairment. The Unlimited Love has been running on every Saturday for 13 weeks on AM 936 from 10am to 11am. Eva Chen. Email: cpsst.eva@gmail.com. Ph:09 973 4734. Mob: 022 632 1053. Office: Level 15, 155 Queens St, Auckland, New Zealand. Chinese Parents Support Service Trust (CPSST) is embarking a journey to ask the Chinese community to Think Differently about disability. “The unlimited love” is the title of the campaign to change attitudes and behaviour that limit opportunities for disabled Chinese people in Auckland. The campaign is funded through the Ministry of Social Development, Social Campaigns Team Family and Community Services. Eva the CEO of CPSST hopes by introducing disability services Chinese people can gain an understanding of the services available for them. “ We hope more dialogue among Chinese community about disability by introducing the disability services”. According to The New Zealand Disability Strategy One in five people, in New Zealand report having a long-term impairment. This can be born, incidents, health issues or require later in life. (The Unlimited Love has been running on every Saturday for 13 weeks on AM 936 from 10am to 11am). Chinese Parents Support Service Trust is recruiting Chinese speaking parents to their pilot parenting workshop funded by the Auckland Communities Foundation. The benefit of this workshop is that it will help Chinese speaking parents to learn skills and knowledge that help to create a harmonious family. “We hope the workshop help parents to build confidence and to learn that parenting can be rewarding and enjoyable”, the CEO of CPS said. A large part of the Chinese family unit emphasis on family’s “harmony” which is not well understood in New Zealand society. This concept is accompanied with the Western concept of “well being”. The Chinese Parents Support Service Trust builds on the strengths of Chinese concept of “harmony”. Besides the workshops, there are various seminar topics that help to increase understanding of New Zealand’s health issues. By doing so, they can effectively engage and better utilize community resources. The support group will be followed after the completion of ten sessions of the workshop. This provides opportunity for Chinese parents with ongoing support through parenting coach. It is only for 12 people, but they hope by securing more funding, CPS will be able to run more workshop for Chinese speaking parents. Please contact CPS on cpsst.eva@gmail.com or call 09 307 1782 alternatively mobile on 022 632 1053. The Butterfly Diaries Volume 1 is a FREE book of inspiring stories and personal tips from four people who have recovered from the experience of being suicidal. NOTE: Event Moved to Sunday 13th of October due to rain forecast for Saturday the 12th. 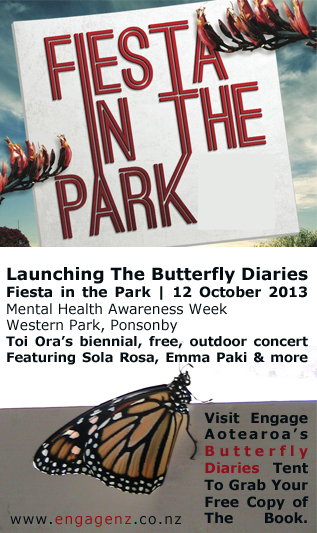 Engage Aotearoa will be launching The Butterfly Diaries Volume 1 at Fiesta in the Park on the 13th of October for Mental Health Awareness Week. 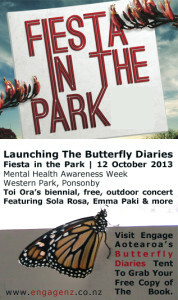 Come along to the free public concert and pop into The Butterfly Diaries Tent – a quiet corner covered in white paper butterflies where you can stop by to decorate a butterfly with a survival tip of your own, pick up a copy of the book, relax with a copy in the reading corner or listen to the authors and editors read from the book. Four true stories of transformation told by four New Zealand writers. Stories by Raewyn Alexander, Henrietta Bollinger, Owen Bullock and Phoebe Wright. In Aotearoa, New Zealand, 1 in 6 people have suicidal thoughts each year. It is a normal human response to feel hopeless sometimes. It takes a great deal of distress tolerance, brute determination, skill development, support and understanding to survive the urge to act on those thoughts and feelings when they arise. But hardly anyone ever talks about suicidal thoughts and feelings, making it even harder for people to find out how to get through. The Butterfly Diaries gives voice to the stories of those who have been there and made it out alive. Sean, Jane, Mary and Brad have all been suicidal, survived their own suicide attempts and found their way to a place where they are glad to be living their lives. In The Butterfly Diaries they share how they strengthened their wings and learned to fly. The first edition of The Butterfly Diaries Volume 1 will be placed in high-schools and GP waiting rooms across the NZ, to make recovery stories easy to find. Suicide rates peak among youth and most people who are suicidal visit a GP in the months leading up to making an attempt, even if they do not talk about how they are really feeling. 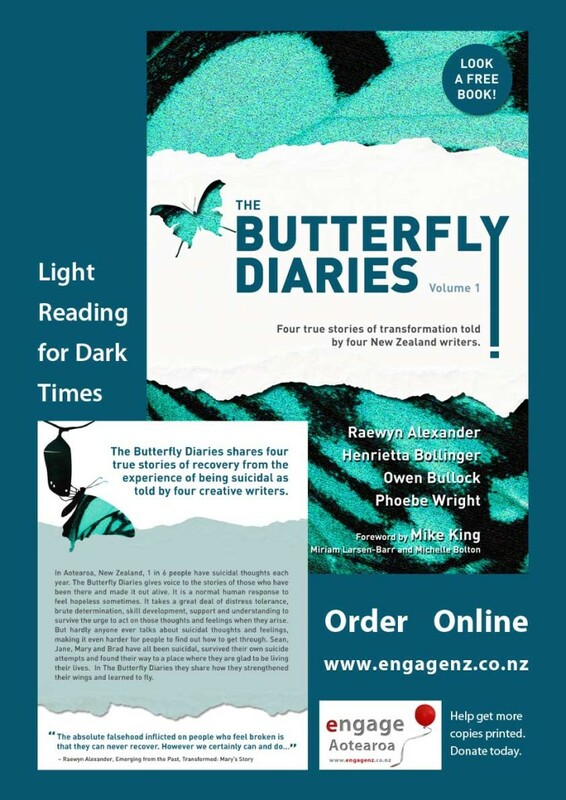 You can nominate a service or person to receive a copy of The Butterfly Diaries or order a copy for yourself by making a donation on the Engage Aotearoa website to cover the cost of posting your book. Just fill in your details and give the delivery address in the space provided. The minimum donation is set at NZ$2.50 (the cost of NZ postage and handling). A donation of $5 will get a copy posted for you and cover the costs of printing a copy for someone else. Want to help prevent suicide in NZ? You can help get more copies of The Butterfly Diaries out there for people to read. Sponsor a print run by making a donation on the Engage Aotearoa website. Every donation over $5 is tax deductible. A $20 donation pays for eight more books. A $500 donation prints enough books for a small school. The onset of mental unwellness overseas caused her pain, hospitalization, a marriage postponement, and fears that her career was at an end, however, Take It From Us guest Debbie Siau has turned her life around in New Zealand, partly through creativity, and social media. Debbie is the Asian representative of the Counties Manukau Mental Health Consumer Network steering group. Hear her story on Take It From Us, PlanetFM104.6 at 12.30pm Tuesday 30 July 2013. And don’t forget our Facebook page @ Facebook.com and type take it from us in the search box; Email takeitfromus@mail.com for feedback and comment/suggestions for shows. The National Advance Care Planning Cooperative team and Waitemata District Health Board ACP clinical coordinator is seeking feedback from Asian communities and health professionals about the attached Advance Care Plan leaflet and form currently available in English. This leaflet provides information about Advance Care Planning by promoting awareness about what to plan ahead for future health care including personal care, treatment preferences for end of life situations, what can be done and who to talk to. This form is for individuals to document their personal care and specific treatment preferences for end of life situations. Additionally, it is about the existence of a will, and the location of important papers and other practical matters. Due to the sensitive nature of the subject matter, the Advance Care Plan Cooperative team would like your views on: the appropriateness of the design/graphics; the colour; the wording used on the leaflet and the form and; whether if there is a need for improvements. In addition, we are trying to find out if there is a need for the form and the leaflet to be translated into different Asian languages. 3. If you know of others who may be interested to provide feedback, please feel free to send this request for feedback and the form to your networks. If you would like to know more about ACP please go to www.advancecareplanning.org.nz. Your assistance, feedback and comments would be very much appreciated and valued by the ACP team. The Canterbury Men’s Centre and Pegasus Health wish to announce the completion and publication of The Chinese Blokes Book. The Blokes’ Book is a listing of Canterbury agencies and services relevant to men’s health and well-being. To order some for you, the men you know or for your office/agency please fill in this form. The Blokes Book Order Form of write to us telling us your address and number of requested booklets at blokesbook@canmen.org.nz. Special thanks to Pegasus Health, and the Christchurch Casino Charitable Trust for making this happen. Chinese people with mental health issues with skills to deal with common conflict situations. Please RSVP by 8th April 2013 as workshop is limited to 20 people. This workshop is hosted by the Vagus Centre (Chinese Mental Health Consultation Services Charitable Trust) in partnership with Yan Oi Sei, Affinity Services, Supporting Families in Mental Illness (Auckland) and Counties Manukau Health. Clicking on the link will download a Word Document. Theme: Exploring the REAL significance of ‘Health for All’ – Should we be concerned about Asian health? The forum will provide a valuable opportunity for you to explore the current health issues of Asian health in Aotearoa New Zealand and improve your knowledge to respond to the same. These major health issues has not commonly being talked about while the population of Asian people has been growing gradually. Join us and explore the culturally appropriate ways to deal with the challenges, in particular to respond to the Asian youth health issues, mental health issues and increasing family violence incidents in our families. Each presentation will be delivered by relevant subject experts from The University of Auckland, Public Health Association and many more. Among keynote speakers we have Dr Suneela Mehta, Author of the Asian Health needs assessment of Asian people living in Auckland region and Mr. Warren Lindberg, CEO, Public Health Association of New Zealand, Kahui Hauora Tumatanui. All those who want to know more about the Asian health components of youth health, mental health and family violence and develop ideas in action plan. Those who are interested in studying Asian health or supporting Asian communities with the issues. Please send your RSVP (samuel.cho@asiannetwork.org.nz) as enrolment is FREE. Limited seats and based on First come-First served basis. Nice Asian style lunch will be provided !